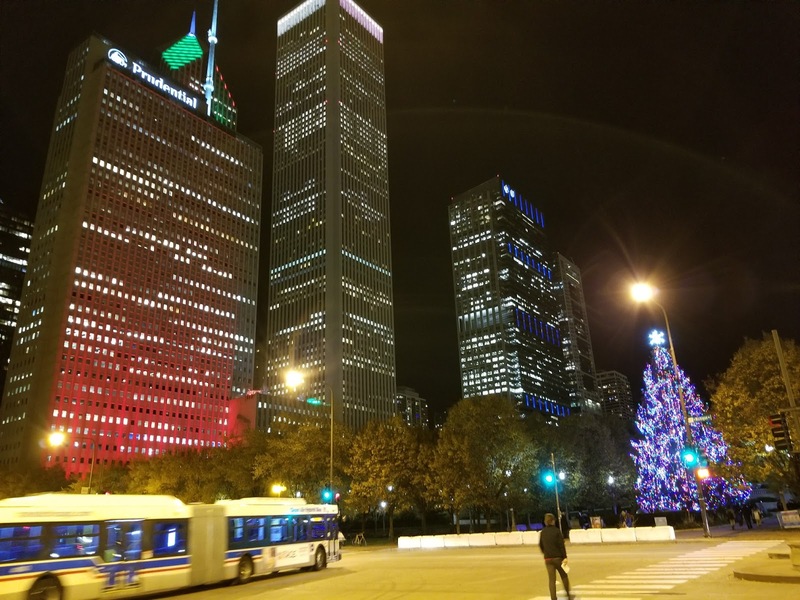 My 2017 RSNA top ten. 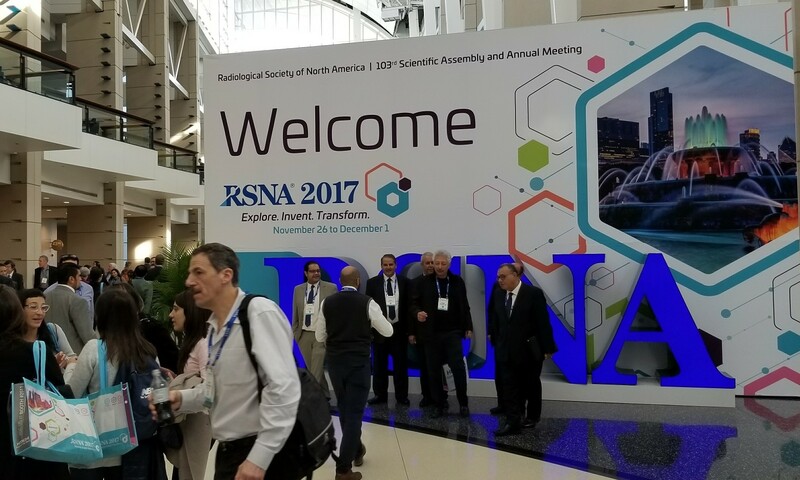 The atmosphere was very positive in Chicago among the 50,000 or so visitors during the 2017 RSNA radiology tradeshow. As one of the vendors mentioned: “Everyone seems to be upbeat,” which is good news for the industry and end users. 1. The AI hype is in full swing – Artificial Intelligence, deep learning, or what ever it is called as shown by the many vendors touting this technology has gotten the attention of the radiologists, who packed sessions, and the trade press as shown by all the front page coverage. It is fueled in part by fear that computers will replace radiologists, which in my opinion won’t happen for many years to come. 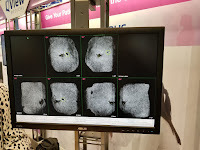 In the meantime, there will be additional tools that might assist a radiologist in eliminating some of the mundane screening exams which can definitely be labeled as “negatives,” but there is still a lot of work to be done and many of the so-called AI tools are nothing more than sophisticated CAD (Computer Assisted Diagnosis) tools that have been around for many years. 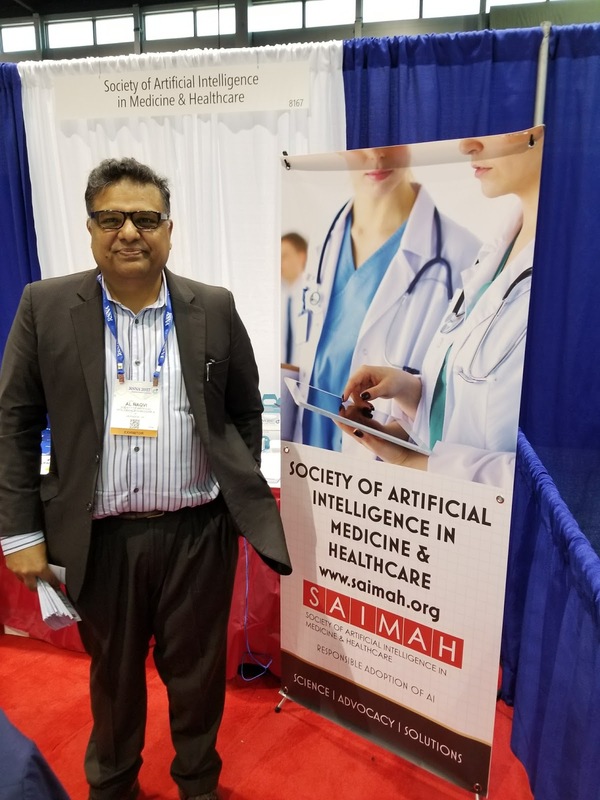 There is also a new society being established for AI, the Society of Artificial Intelligence in Medicine and Healthcare (SAIMAH). I guess every new technology needs its champion and corresponding non-profit to promote its use and efficacy. 2. Talking about CAD, this has become rather commonplace in the US for digital mammography screening, which is interestingly enough not the case in many other countries, especially Europe, where they do double-reads for mammography. 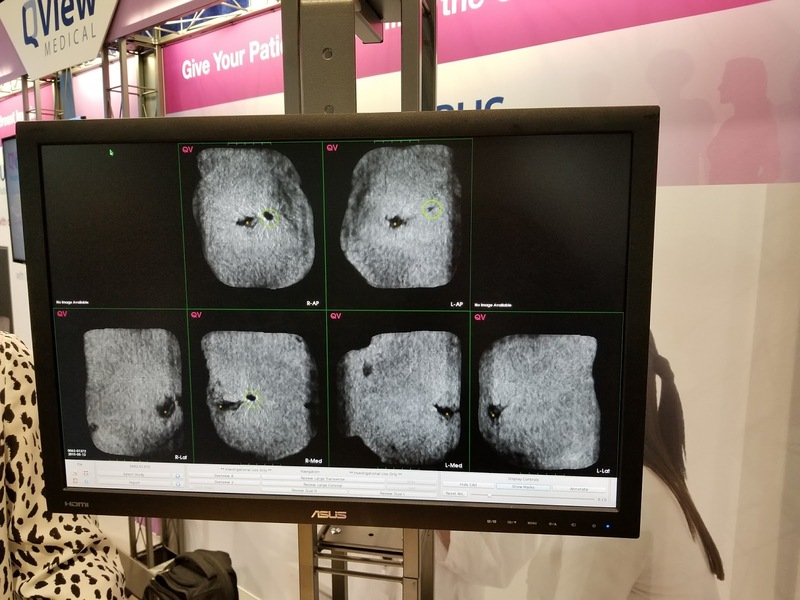 Algorithms are now becoming available for other modalities as well, for example for the ABUS (Automated Breast Ultrasound System). 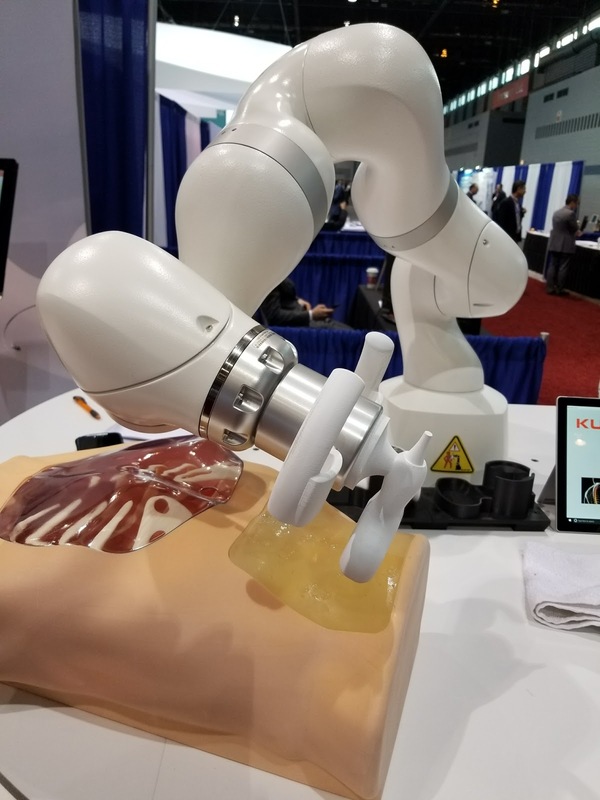 One company showed their CAD algorithm which will become available in the market as soon as they get FDA approval. 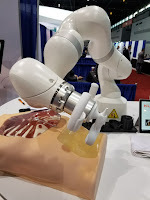 I expect that CAD for several other modalities and body parts will follow suit, in addition to the already commercialized CAD for lung nodule detection in chest radiographs and CT and breast MRI. become obsolete and be replaced by robots. Well, maybe not quite, but there is definitely a potential. 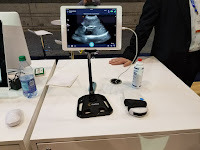 One of the large robot manufacturers was showing its device performing ultrasounds, which can be used to perform remote procedures “tele-ultrasound” in case there is no local technologist available, while performing repeatable procedures using a uniform pressure over the whole sweep performed by the robotic arm. It will be interesting to see what new applications become possible using these robotic devices. Virtual currency (Bitcoin) in medicine? Blockchain technology has become the main vehicle to propel the popularity of virtual currency to new heights. The underlying blockchain technology is very useful for managing public records, which need to be secured from unauthorized users. The records are automatically duplicated on tens of thousands of computers and accessed through an extension of a common browser that accesses the blockchain network, in this case Ethereum. 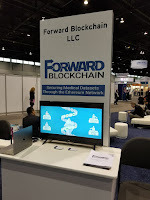 A demonstration of a possible application that manages the licensing of physicians in the state of Illinois was shown at the show. This technology might have certain niche applications in healthcare IT. However, for managing medical records, which must stay private, it would definitely be a problematic solution (unless is it encrypted which defeats the purpose of public access), as well as for images which are definitely too large for this application. 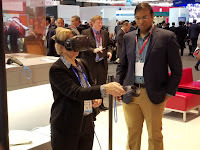 demonstrating 3-D stereoscopic displays, which could be especially useful for surgery applications. It still looks kind of weird to see users with these large wrap-around glasses on while waving a wand into space, and I think it might take a few years for this application to mature beyond its “gadget” state into real practical use. 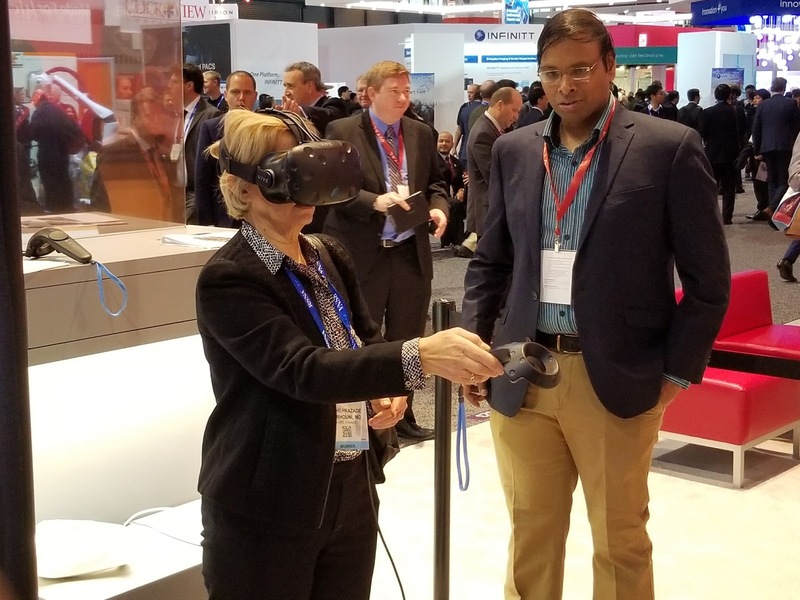 But this is a field where the gaming industry has provided some real spin-offs into practical applications that might potentially benefit patient care. 6. Cloud-phobia is getting stronger – Moving your images to the cloud for image sharing was one of the previous year’s hot topics, especially as cloud providers (Amazon, Google, Microsoft and others) have been offering very competitive rates for their storage capabilities. 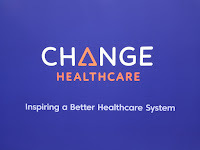 Despite the fact that the data are probably safer and more protected at one of these cloud providers than at many corporate healthcare IT facilities, there is still a concern among users about potential HIPAA violations and potential hackers looking for patient demographics, which if accessed, could be downloaded and resold on the black market. 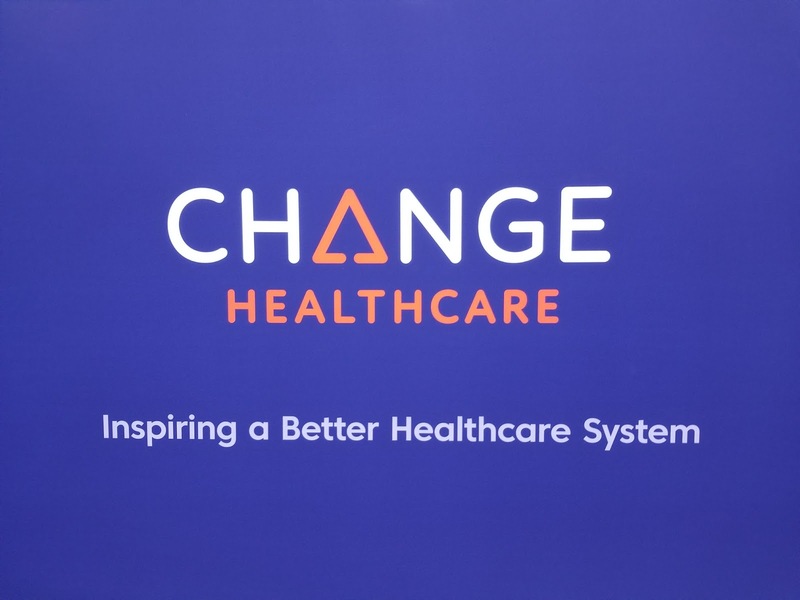 As an alternative, some of the image sharing service companies are starting to provide secure point-to-point transfers managed by their own patient-driven portal. They provide an access key to the patient who then controls access by physicians and obviously themselves as well. This looks to be a good alternative if you don’t trust the cloud. 7. 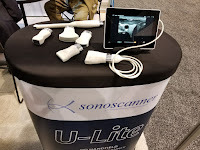 Ultrasound units are becoming commoditized. 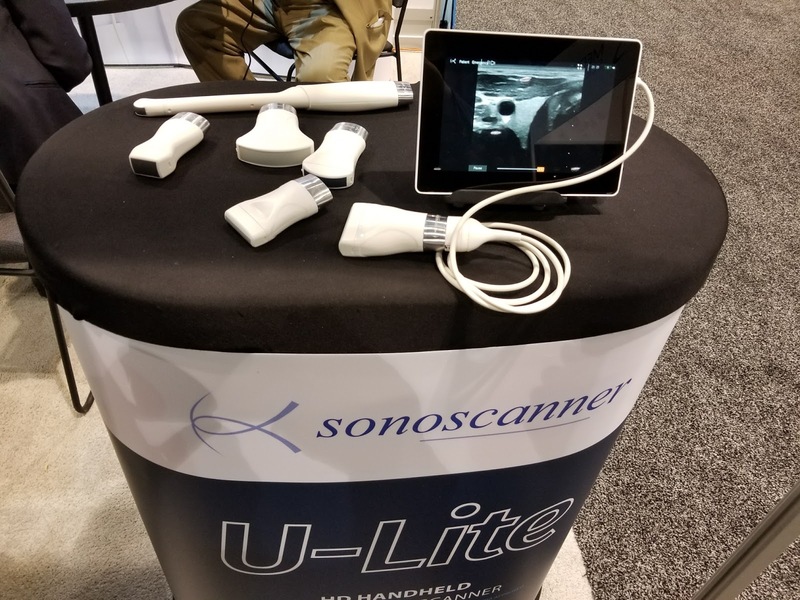 Miniaturization and ever increasingly powerful tablets allow for ultrasound units to be carried in your pocket facilitating easy bedside procedures and also to giving workers in the field, particularly in remote areas, the capability to do basic ultrasound exams. 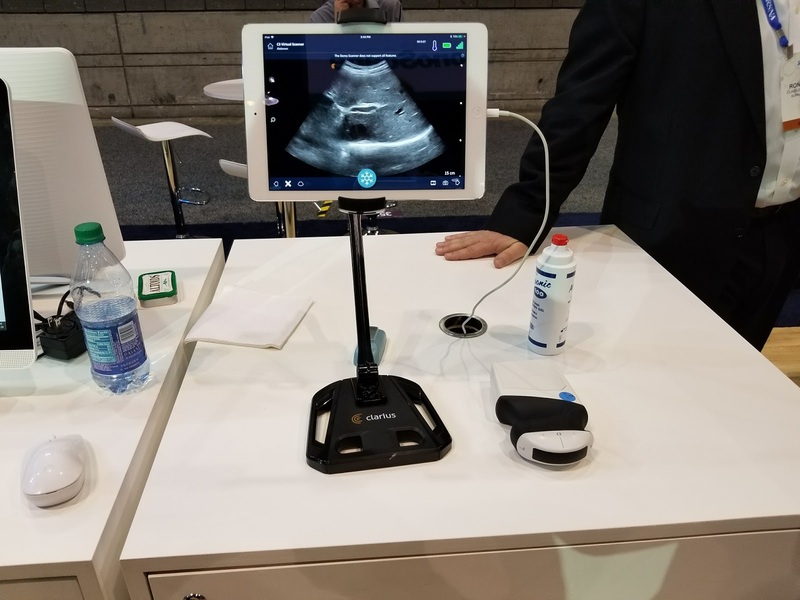 two different approaches to this technology, the first one puts all the processing in the tablet allowing for very lightweight probes, the second one is the opposite, it puts the technology and processing in the probe, which can even be wireless and uses standard tablets (IOS or Android). The latter results in probes that will produce heat and are rather heavy, especially if they need to contain a battery in the case they are wireless. Ergonomics is gaining traction. Patients could potentially be intimidated by these large diagnostic radiology machines while having to lay on a table staring at the ceiling when being scanned. 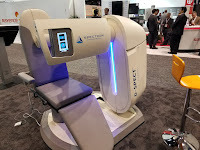 Instead, being able to sit in a comfy chair while your scan is taking place could provide a more pleasant experience while allowing for eye contact with the technologist as well. 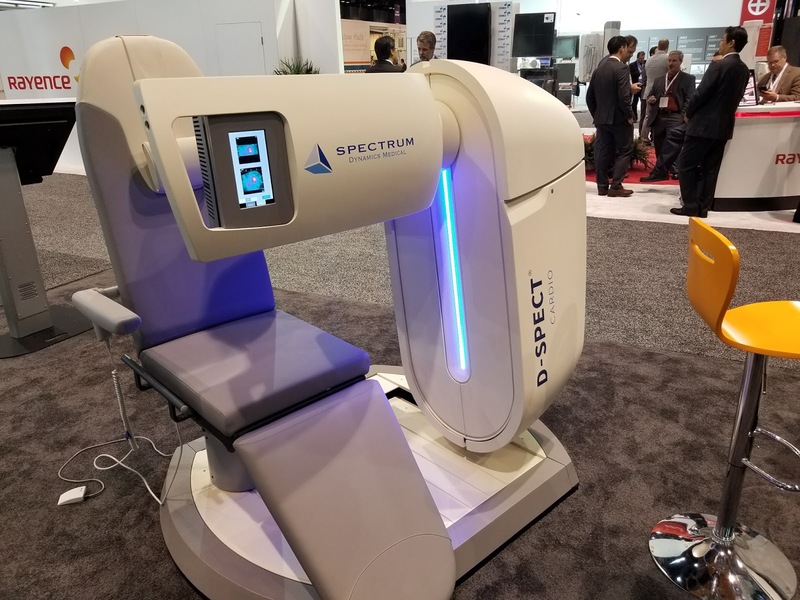 Case in point a SPECT scanner offered by one of the vendors. Who is this company again? become Hyland, Toshiba is now Canon, Merge disappeared to become IBM and others were swallowed by different vendors, spun off, or re-branded themselves. The good news is that there were probably as many “first-time vendors” as there were “last-time vendors” showing that there is still room for new start-ups bringing in fresh ideas and innovative products. But it is always with a little bit of nostalgia, having worked for one of these “giants” for a few years in my past life (notably Kodak), to see these names disappear. 10.Last but not least, Chicago (still) rocks. After attending 30 RSNA’s I stopped counting, but every year it gets better. The food prices and lodging costs are still exorbitant, but instead of the always notorious cab drivers who talk non-stop on their cell phones in a language you don’t understand and don’t get out of the car to help you load your luggage, there is now Uber or Lyft to bring you to where you want for half the price. Even better there is the opportunity to provide feedback for your driver on your phone after your ride (what a great concept!). And it is always fun to watch the many international participants at the show and try to guess where they are from based on their gestures and clothing (the Italians always stick out!). This was another great year, new hype, good vibes and fun, looking forward to next year already!